Born John Michael Palmer, May 25, 1943 in Evesham, Worcestershire. 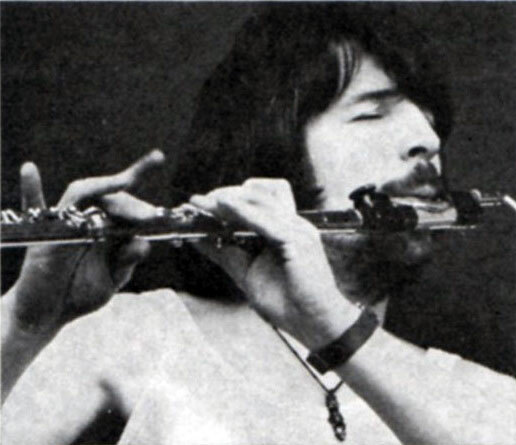 Played vibes, flute, piano, synths and drums; with Family from late-1969 to late-1972. Palmer also took part in the 2013 reunion shows. 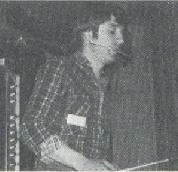 Palmer replaced Jim King in Family and immediately went to work on the group’s third album, A Song For Me. Many of that album’s songs had to be re-arranged, as they were written with King’s saxophone and harmonica in mind. Palmer rose to the challenge, transforming songs with his different instruments. “Drowned In Wine” became a full-blown rocker with his overamplified flute, and his vibraphones added a jazz touch to the blues number “Love Is a Sleeper.” A Song For Me was released in January 1970 to rave reviews, and Family seemed re-invigorated by Palmer’s arrival. Palmer would contribute on the next two Family albums, Anyway and Fearless. On the latter album, released in 1971, Palmer contributed the jazz instrumental “Crinkly Grin” and the song “Larf and Sing,” which he sang lead on himself. After 1972’s Bandstand and a U.S. tour as the warmup act for Elton John, Palmer left Family to form a group with fellow Family alumnus Ric Grech, but that effort never got anywhere. Tell us something about your musical upbringing, and what led to your equal abilities on a number of instruments? 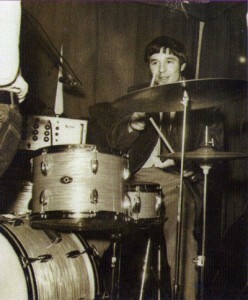 I started playing drums while still at school….about 14-15 I think. I was always into Jazz and Blues. I went for drum lessons with the local pro and he played vibes. As soon as I saw him play them, I knew that was the horn for me. Although I had lessons on drums, I taught myself vibes, etc; (although I did do a lot of reading up on counterpoint and harmony.) I can bluff my way round a piano keyboard because of the vibe layout. The flute, I picked up because I thought it would be great to take an instrument out of my inside pocket and sit in with a band! Unfortunately, I’m handier with my wrists than my fingers, so I bluff that too……… Basically, I’ve always thought of myself just as a vibes player. Let’s get some info about two “supergroups” of the mid-60s: The Hellions and Deep Feeling. I read that yourself, Jim Capaldi and Luther Grosvenor were in both bands. Was there any difference between the two, other than in name? As you probably know, we were all from Worcester, which is a sleepy country town about 30-40 miles south of Birmingham… Jim put The Hellions together as a 4 piece (it was named after a bad British 50s “B” movie about truckers carrying dynamite) It comprised of Jim on drums, Dave Mason and Gordon Jackson on guitars and a guy called Dave Meredith on bass. As was the case in those days, all the guys sang harmony stuff, but it was decided that Jim should come to the front and do vocals. So, they asked me to join and Jim and I alternated on drums. At that time we were doing soul material. 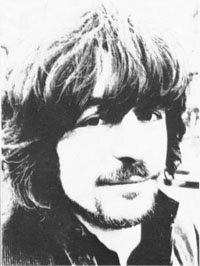 After a while Dave Mason left. Whether it was for new horizons or a personality clash, I can’t remember now. That was when Luther joined and we became The Deep Feeling. By now, we were doing different material, not original but stuff other bands weren’t doing ( I can remember doing some Oscar Brown Jnr songs.) We got signed lo Marmalade Records and it’s boss, Giorgio Gomalski (who had previously had the Yardbirds) encouraged us to write original stuff. I think we recorded about 6 cuts with that lineup but I don’t know if they were ever released. As hard as it is to imagine vibraphone in a rock band such as Family, it is even harder to imagine it in a mid-60s combo! Did you play much then? In Deep Feeling, Jim and I both played drums. When he sang, I played kit and when he drummed, I would play vibes or flute (or piano if the venue had a reasonable one). Remember that in the mid 60s, there weren’t the exotic sounds that we have today. Guitarists didn’t have WahWahs or Flangers or Distortion. The only portable keys were really cheezy organs, so vibes gave an interesting colour. And, although it’s thought of as a jazz instrument, I’ve never seen it that way. I like playing country or folk on it, or running it through a fuzz box! How did you come to join Blossom Toes, and how long did you play with them? Is your only recorded appearance on the single “Postcard/Everyone’s Leaving Me Now”? After Traffic formed and Deep Feeling split, I got a call from Blossom Toes. (who were also on the Marmalade label) So, in 1967, I moved to London. I used to have the vibes set up by the hihat and the flute in the stick bag! I think I did 3 singles with them. “Postcard” – “Be my baby tonight” (Dylan song) -“Peace Lovin’ Man” I Can’t remember the “B” sides. I was with the Toes for about a year. You were in Eclection for a very short time right before joining Family, and I’ve seen them described as a folk group. What was your main musical interest in the 60’s … jazz, psychedelic, folk, or all of the above? I was with Eclection for about 9-10 months. Didn’t record with them, as they had contract problems, although we did do a lot of festivals and TV. 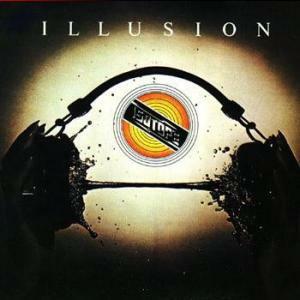 Eclection was the first band I joined in which I wasn’t the drummer. It WAS a very eclective group. Three folkies and three rockers ……….. As far as musical interests are concerned, I’ve always enjoyed the best of the last 90 years, be it jazz, classical, folk, blues, etc; and I’m happy to play any of it. Did you get to know Family by sharing concert billing with them? Strangely enough, I knew Jim King before any of the other guys. While I was in the Blossom Toes, he used to come round to the band’s house and we would sit on the back porch and play flute/soprano sax duets. When Family released the album “Family Entertainment”, they played the Royal Festival Hall. They decided that, as well as doing the regular set, each member of the band would do a featured number. Rob Townsend didn’t know what to do for his bit, so Jim King suggested that he should ring me. I wrote a little tune for us to play which we did at the gig. (Incidently, it was never titled, but when we played it on a John Peel show much, much later, I believe it was named “Here comes the Grin”……. I expect Chappo called it that.. …… I could never come up with titles, so he used to name most of my stuff.) Anyway, with that gig and drinking with Roger down the “Speakeasy” (the main club at the time), my name came out of the hat when they needed a new player. No, Everything was fine. The band made me very welcome. To be honest, the reason for Jim King leaving, was that he was finding it very difficult to cope with life/rock&roll/and being in a band, him being a introvert. I always thought he was a great sax and harmonica player. As far as audience reaction, I never noticed any negativity. Did you ever play live while he was still in the band, making it a six-piece? Not live, but we are on one cut together. “Good Friend of Mine” He’s on soprano sax-I’m on vibes. Technical question: can you list some of the equipment you used during your Family days?Vibes, synths, flute, electric piano? You often added percussion to Family’s sound. Did this take place on stage too? Did you ever use a full second kit, or was it small hardware (congas, etc.)? Only congas………by this time, I was getting rusty on the Kit…..
Did you use a different vibraphone for live playing as opposed to studio work? In the studio, I would use electric or acoustic vibes the same way a guitarist would use an electric or acoustic guitar. Well, in the studio we would throw at lot of ideas at the wall and see if they stuck. Some tunes we would record almost live and other tunes would be started with acoustic guitar and congas and then “layered”……There was never any single method for recording. Was there a lot of ‘band’ participation when it came to arranging music? With all the touring you did, was there any time for rehearsal? Yes, there was input from everyone in the band. When we were about to record an album, we would rehearse songs and then play them in at gigs. This would hone the tunes up, so that when we recorded, we more or less knew what parts worked. You were with Family for most of the band’s recorded career. In your opinion, what made Family so special? It’s difficult for me to be objective about Family’s “sound”, but I guess we all came from completely different musical styles yet enjoyed playing together. In my opinion, 95% of Family’s “progressiveness” can be traced to you. It’s nice of you to say so, but Charlie wrote some mean chords and rhythm timings! Did Family give you an outlet to do unique things in a rock’n’roll context? Yes. The band never thought in terms of labels, so we didn’t think it odd to put, say, a country fiddle with some “expensive” vibraphone voicings. During the Family “heyday”, what other bands did you all (or yourself alone) look to as influential? Well, apart from our individual influences, we were all brought up on ’50s rock/ blues. Here’s some of the artists we listened to on the way to a gig: The Band -Joni Mitchell -Hendrix -Zappa -Taj Mahal -Miles Davis -Randy Newman -Traffic -Otis Redding -John Coltrane -Doc Watson …….. l could fill your hard disk! Was touring with Family your first experience with international travel? I understand that the U.S. tours were tough-going. No. All the bands I played with, worked in Europe. In those days, (pre- European Union) the equipment had to have it’s own passport and be inspected at every border post and we would drive ourselves to most countries. (no road crew) It put me off driving for years! In comparison, tours with Family were somewhat of a luxury. (flights and roadies) I think most bands get US tour fatigue, which usually culminates in TVs getting thrown in swimming pools or a visit from the local constabulary! (Actually, it never happened to us, although it was a close call a couple of times.) The problem isn’t the gig itself, but after 2 months on the road, you suddenly wake up in the Buffalo Holiday Inn and realise that you don’t know which state you’re in. The picture over the bed is the same one that leered over you in Jacksonville yesterday and you know the coffee shop menu by heart. (Part of the Load!) In Europe, it’s easier on one’s sanity because of the different languages, money, food, etc; Having said all that, I used to enjoy the touring. Are you still fond of any particular Family songs/albums (especially your own)? various bands and it doesn’t seem to show it’s age, either. (Believe it or not, this was the easiest tune I ever wrote! …. done in 10 minutes) “Burning Bridges· has a great mood to it and “Willow Tree” is a very weird ballad. Almost classical. There are a couple bits of playing that I’m pleased with, that came about by totally by mistake. When recording, we often. used to jam for a few minutes, to get the correct groove and then, when it felt right, Roger would cue us into the song. In the case of “Take Your Partners” and “Top of the Hill” we liked the jams, so we kept them in. With “Take Your Partners” , there was a Farfisa organ in the studio at the time, waiting to be collected. It had a weedy sound, but interestingly, had a foot pedal that dropped the keyboard an octave. I recorded 2 takes which we mixed together. With “Top of the Hill”, I like the E. Piano chords at the front, which I probably wouldn’t have done if I had thought that they were going to be used! At the time did you compose any pieces that never made it onto albums, by veto or space consideration? an album, tracks were invariably carried over to the next. Describe what you can about the rarest of Family songs, “Here Comes the Grin”. I think I covered this … I didn’t know what the tune had been called until very recently. vocals. I would have liked to have recorded a Family album with Jim because he is a great record producer. “Bandstand” was not the most adventurous of Family albums (compared to “Fearless” and “Song For Me”). Was that an indication that you were taking less part in the compositions? Once again, it’s very subjective. I’ve seen some reviews that think “Bandstand” was the best Family album and “Fearless” the worst.. … Me, I’ve no opinion. There are tracks that I like and dislike on all albums. Technically, “Bandstand” is probably the best recorded/mixed album of the bunch. (Maybe it’s too clean!) I like “Burlesque” as mentioned before. 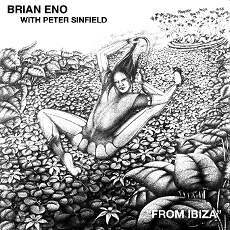 I also like the 20 piece string arrangements on “Top of the Hill” and “Bolero Babe” Although John Wetton and I didn’t write much on this album, we overdubbed a lot of keys and I did a lot of synth stuff. In terms of your last days with Family, a number of articles point to conflicts in the band over the time you spent programming synths during concerts. Was this blown out of proportion, or was the state of technology at the t ime in some ways your worst enemy? Well, (as explained in an earlier question) it was certainly a problem tuning the synths on stage. There was no such thing as a visual tuner in those days, so they had to be tuned by ear. This was also a problem for the other guys, too. Charlie used a double neck (six and twelve string) and an accoustic. Jim was using a double neck (six string and bass) and an accoustic. I think you’re right. I was probably using the technology beyond it’s capabilities. For instance, as I mentioned earlier, I had some electronic vibes built, because none existed at the time. All the vibe notes were linked by wire in a loop. If the loop were to break, then the vibes would go off and then a roadie would have to crawl underneath with a torch and soldering iron to find which one of the 37 links had broken. Did all this lead to conflict? I don’t think so. We were running out of steam as a band. (and probably individually, too) The trees were starting to obscure the woods and as you know, the band folded about a year later. By the way, many think that the switch from Poli Palmer to Tony Ashton was the worst change in Family in terms of losing character. I can’t possibly have an opinion on this as I’ve known Tony for ever and he’s a great player. Is there still an association with the name, and is that something you’d prefer to live down? People still remember the band very positively. I was happy to have been part of Family and I’m quite proud of some of the stuff we did. How did your participation in Family affect your career afterwards? Well, I must admit, I compared lot of other singers unfavourably to Roger. He’s a hard act to follow. Also, I was used to playing tasty songs with interesting arrangements, so I found it hard to slot into another band. I did try to form a band with Rick Gretch and Mitch Mitchell shortly afterwards, but it didn’t happen. For a while, I became a bit of a studioholic. Didn’t do any gigging for several years. This was not a good idea, because I have always needed the one to enhance the other. In 1974, Mitch introduced me to two Australians who had been commissioned to write a Rock Opera for the Sidney Opera House. 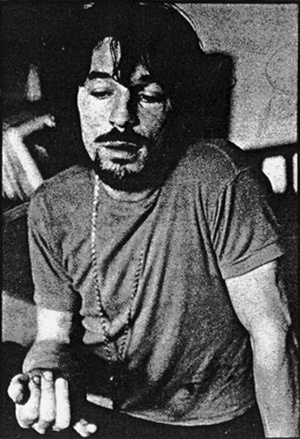 The lyricist was Don Henderson, a well-known folk singer over there and the libretto was written by Craig McGregor, an equally well-known author/journalist. It was called “Hero” and involved classical singers from the Opera House as well as rock singers. Unfortunately, with no public response, it only ran for 4 weeks. I tried a few things over the years, but little ended on vinyl. One project I did like was an EP by Henry McCullough (Grease Band, Wings) called “All Shook Up” released in Germany in 1982. He’s a great guitarist/singer. Sort of Hank Williams meets Little Feat. Even though you lett Family, you contributed to three Streetwalkers albums and the first four solo albums of Roger Chapman. Was this relationship with Whitney/Chapman in needed “mending”, or was it easy to jump right back into working with them? Nothing to mend. If they needed something I could do, they gave me a ring. It was always a pleasure. And, as you know, during the 80s I did a lot of European tours as part of Roger’s band, The Shortlist. That was also very stimulating ……. excellent musicians. What led up to your 1985 solo album, Human Error? What interest do you have in “electronic music”? (most obviously Kraftwerk, Tangerine Dream, Can.) Do you feel that this music can be properly played in a live setting, or might it even be improved upon in concert? With that said, did you ever play live around the “Human Error” album? As you know, I’ve always been heavily involved with electronics, but I do find a lot of the music a bit soulless. I don’t think this is the fault of the gear so much as the artist (remember the old computer dictum, Garbage In – Garbage Out) in the early days, I was impressed by the Japanese synthesist, Tomito. His sounds were emotively human. Also, Stevie Wonder’s early albums had great warm synth lines. Another influence was Steve Reich. (he uses accoustic instruments, but his pieces are slowly changing collages of sound.) Can electronic music be played live? I really think it depends on the music. if the music can’t breathe bit and have different nuances each performance, then we might as well listen to a recording of the piece. If there had been more interest in “Human Error”, I would have enjoyed doing some live concerts with the material. You’ve also had some involvement in the past with “Chuck Farley”, a loose association of musicians led by guitarist Steve Simpson. Are you still involved with them? Have they ever recorded, or has it always been a casual affair? The band was a relaxing alternative to touring and we would play small London music pubs quite regularly. 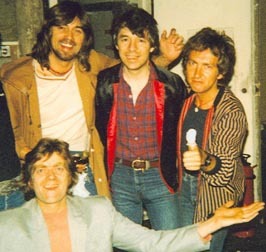 The original lineup was: Steve and myself, Boz Burrell, Geoff Whitehorn and Alan Coulter. We did record an album called “Chuck Farley- Live” with a limited pressing of 2000 copies. It’s now rarer than a Monica Lewinski dress in a dry-cleaning shop. The band did regular gigs from the the late 70s until the mid 80s, but it then became very hard to get everyone’s diaries in sync. We stiil fire it up about once a year. (last time was about 3 months ago) The current line-up is: Steve/myself, Pat Crumly, Pete Stroude, and Sam Kelly. Occasionally Steve calls me up and we do a little duo gig together. 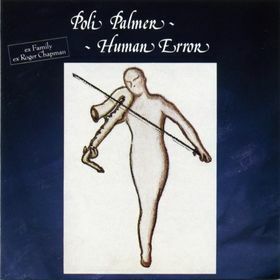 Please squash this rumor … I read on the internet somewhere that a “Poli Palmer self-titled album” was due back in 1996. Are there future plans for Human Error follow up? No. There was a provision in the Erdenklang deal for a second album,but there is nothing in the pipeline. Who are some of your current favorite artists? Oops, one question I forgot. Does “Poli” come from Palmer? Does the name come from hanging around with a lot of other “Johns”? Deep Feeling (1966) with Capaldi, Mason, Luther Grosvenor (later of Spooky Tooth), Gordon Jackson. 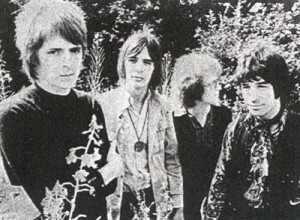 Eclection (Oct. 1969) – a “cosmopolitan folk-rock group”; Poli joined for one month, then left for Family.